Do you long to walk through idyllic flora-laden trails while breathing crisp clean air? Well now you can every day, if you wish, on the numerous trails in Big Canoe in the North Georgia Mountains. 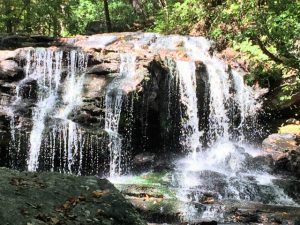 Nearly one third of the 8,000 acres in Big Canoe are devoted to green space crossed by over 20 miles of verdant hiking trails to be enjoyed by all ages. Information Kiosks and trail heads are located at six major parks and Waterford Lakes. You can choose from several trails and parks, with their own appeal and special features, including Nature Valley Trail with cascading waterfalls, an early settler’s cabin, a water wheel and moonshine still. Indian Rocks Park delights your sense of history with legendary 18th Century Cherokee Indian Mounds and trails to Lake Petit. 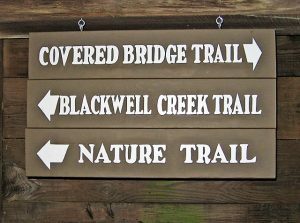 Blackwell Creek Trail has various offshoot trails under the captivating covered bridge on Wilderness Parkway, and along Blackwell Creek’s waters rippling over random huge boulders. Disharoon Lake Trail features footbridges over the lake, a water slide and overlooks Creek Golf Course. McDaniel Meadows Trail has paths lined with colorful flowers, a creek, and a fenced-in dog park. 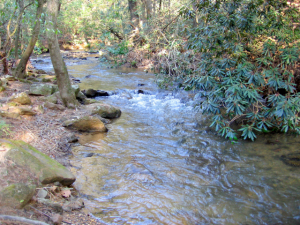 Nancy Womack Trail leads to a splendid waterfall and higher mountain elevations. Wildcat Park Trails are paved for hiking and biking. They are nestled in the woods where bridges cross over streams, and rest stops are provided along the way for examining interesting bronze sculptures. Other lovely trails are located in Choctaw, Meditation Park, Play Field Park and in Waterford.